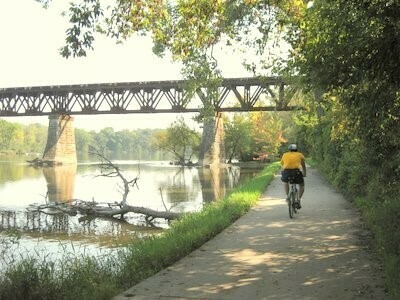 Bike the Fox River Trail from Aurora to St. Charles, starting at 9:30 AM. The Fox River Trail is a paved trail that follows the Fox River as it meanders through Kane County. The trail connects numerous local parks, forest preserves and other attractions along the river including the Fabyan Park Forest Preserve Windmill and the Fabyan Villa Museum and Gardens. We will pass through the communities of North Aurora, Batavia and Geneva before reaching our destination in the community of St. Charles for brunch or lunch. Return route will follow the same trail in reverse. First 20 to register will be included in reservation for brunch/lunch at Brunch Café. https://www.brunchcafe.com/. Registrants beyond 20 are welcome to join the bike ride and patronize one of a number of restaurants nearby that primarily serve lunch. Brunch Cafe Website: Click here.